My connection, I always was trying to find myself through makeup. I started in high school, I just with small stuff like mascara and, eye liner. I always tried to enhance the beauty that I already knew that I kind of had. It's still like that, just that balance. I didn't look up YouTube videos. I only do that stuff, to be honest, now sometimes, depending on a look I'm trying to go for. I just always try to maneuver around what I feel comfortable with doing. I would always start very light, like lipstick and mascara and that was really it for a long time. Enhancing my own beauty. I used to work at Sephora, I got hired for skin so that was my journey. I realized that a lot of the girls that I would look up to before I worked there and I would be like, "Oh, my God." Their makeup is incredible, they always look on point, their skin looked flawless. Then when I worked there, I had an inside schooling where they would train you internally. It was cool because different brands would come in. There would be days where only the workers would be on site inside the store and it would be for them to maneuver and learn different things from different brands. It took me so long. I've always been a hair girl. In high school, I'd have literally a different hair style every single day. 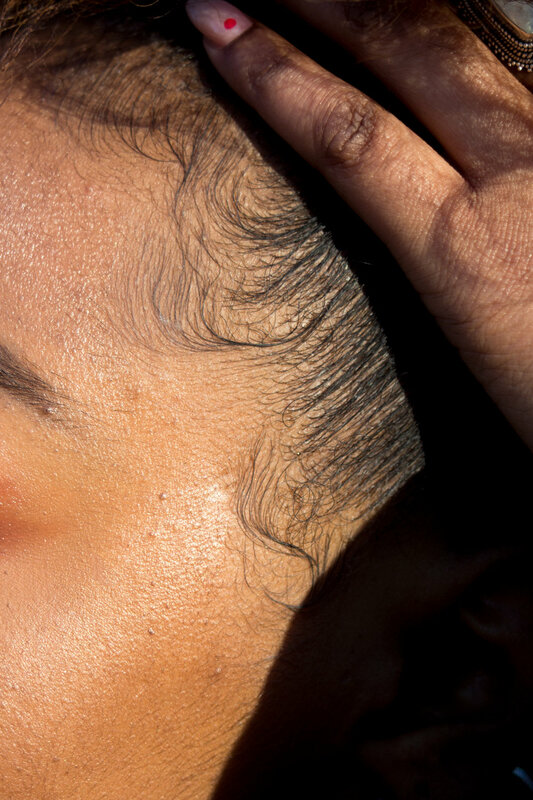 My baby hairs were wild and gelled down on a Twig's level. I was crazy. But, I hated my natural hair. I hated it, I did, until Grade 12. Literally for four years straight, probably even five, maybe from grade eight, I would straighten my hair like crazy. If I seen it going back even just a little bit frizzy, I would go home and straighten it out. That journey was a lot, because I was very self-conscious about my curly hair. Also, I was very self-conscious about my forehead. I had to really embrace that, I won't lie. I would always have bangs, I had bangs for four years. Then, I was like, "You know what? I love myself. I'm just going to manifest a different Khadijah and step into it." Embrace my curly natural hair. It took me, maybe two-and-a-half years to get it to revert back, because I didn't want to do a big chop. It was a long time of people asking me if I have a perm in my hair. It looked really bad. The heat damage was horrible. What was being pushed to us a lot was to be, especially being a black woman, was to be an acceptable black girl, you needed to straighten your hair. I would always see women that I looked up to, they had straight hair or it was blonde. I just always felt like that was the standard for beauty at the time. I do a wash n' go every Sunday. I had to learn that I can't use soaps that actually sud up for my hair. It's better to use something like DevaCurl. They have a shampoo that doesn't sud up. It's like a conditioner when you're using it. The only thing is, even when you're washing your hair, it may not feel like it's doing the job, but it is. That's to retain the moisture, because most of my moisture was lost from straightening the hell out of it for five years. That was something I had to learn. I had to walk around with a little spray bottle with water, a little bit of oil, and a conditioner that I loved, to spritz my hair throughout the day to keep it moisturized. On Sundays, I will do a co-wash. I have a co-wash, like a Jane Carter or the DevaCurl that I'll use. If I do need to wash my hair, I need to use a clarifying shampoo. I will use, Dr. Eli's the black soap shampoo. That's my favourite, because it just strips it, and I'm able to wash my hair and make sure it's good. Then after, I'll do a hair mask. I like Monoi oil, there's a hot oil hair mask, to keep the moisture in my hair. I keep it on over night, or sometimes I will wash it off. Then, I will part my hair and do one side, I'll maybe have eight flat twist-outs. I'll do a Bantu knot at the end, and then leave it. In the morning when I'm getting ready to go to work, I'll just pull it out. If it's still wet, I have a diffuser. I love it. I haven't straightened my hair in so long. Hair, is the least amount of maintenance possible. Twist-outs and flat twists are my best friend, or wash n' go's. That's really it. I always carry a toothbrush and some edge control. Same thing with my makeup, I hate wearing mascara, that's one of my pet peeves. I hate it. I would rather get mink false lashes that last longer and just fall off eventually rather than mascara. So I try not to do a lot of that or eyeliner, and I know that's the first thing I started with, but I don't like it anymore. Also, if I have a lip gloss I normally put that on my lids, maybe blend it with a tinted colour or something. I try to follow certain makeup trends, but in my own way, rather than buying. I just don't think I need to buy the actual, the high end gloss product for your eyes. I straightened my hair all through high school and I hated my natural hair for a very long time. Growing up and trying to filter my environments to make sure that the representation that I'm seeing is actually what I needed. I started to build a strong group of girlfriends who looked like me and who inspired me to wear my hair natural and really got the inspiration within myself and my peers to just try to move away from the norm and what everybody else was doing. That kind of started when I was in high school. Then growing up, social media became a huge part of our lives so that's the same thing that I try to do is try to follow a lot of women of colour that I look up to. I make sure that I am gravitating towards that and I'm not getting lost in other things that don't align with who I am. It's really just having strong black women around me, to be honest, that I really looked up to or the conversations we would have, we would click together and make the decision to shift and just start to do things that aligned with us and not be this clique or follow other people.I'm really happy that I was really conscious during those times. I didn't really need somebody to tell me that I should be doing something else. I just figured it out on my own with my friends. The YSL All Hours Concealer is my go-to, I think I'm going to love it for life. I'll probably buy it all the time now. I like that it matches, and it's still able to do the job. It's the best. L.A. Girl Pro Conceal in pure beige for highlighting and L.A. Girl Pro Conceal in dark cocoa for conturing. The Anastasia Brow Pomade in dark brown. It's life. It's my best friend, I've had it for so long. The NYX Professional Micro Brow Pencil with the spool on the end and Essence Make Me Brow, these are incredible, as well. I like that they fill in as you go through, but it doesn't make your brows look completely dark. I don't like the block look, I still want you to be able to see the hairs.This is really great for that. I have sparse brows, so I like that natural look, too. Then NYX is my favourite place for lipsticks. I'm in love. My favourite one, the cream lipstick liquid suede in number 23. Club Hopper is the name. I also like the Peter Thomas Ross Illuminator and the Absolute New York brand pearl bronzer. I used to hate my cheeks, and now I love my cheeks and my smile.